Hey everyone! So....for the last little while we've been enjoying the digital version of Season 6: Underground Rising of the Brinkman Adventures! 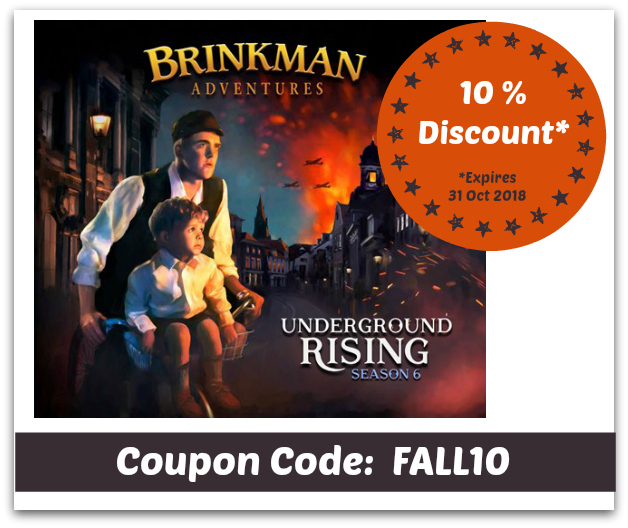 The Brinkman Adventures is an audio drama program that is based off true stories of one missionary family, and their grand adventures around the world spreading the love of Christ. And let me tell ya, they can get themselves into some pretty interesting adventures haha! 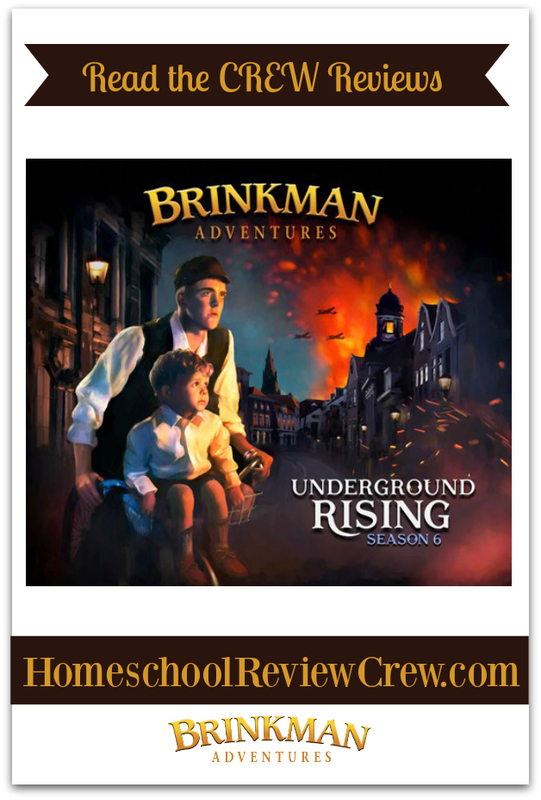 When Brinkman Adventures first started back in 2009, the children volunteered to voice the actors. I have always thought that was pretty awesome! To be fair, these stories ARE elaborate versions. They are not 100% true story, but rather based off the inspiration of their true stories. I like the Real Stories link on their webpage. This page goes into detail on each episode-what is true and what is made up. It gives insight into the family, and the radio program. There are even photos! Episode 55: This is based off the true story of Reng and Lynn VanKesteren's experiences during World War 2. Lynn write a book titled, "Great is They Faithfulness." It was details from that book, along with interviews of her children that provided the structure for this episode. In part one, we hear about the beginning of their work in the Dutch resistance. Episode 56: This is the continuation of Reng's involvement in the Dutch Underground. After his brother was captured, Reng became the leader of their area. This is a very interesting episode full of excitement and action. Episode 57: I often say I dream in movies. I have dreams that are so vivid that they'd make great TV or action movies. I have often said I need to write them down, and that's exactly what they did for Episode 57. This is based off a dream Ian had, and included a cute bit about a fly that flew into one of the kid's mouth! I love...LOVE...the little kid voices and talking in this lol. "Dat's not a bug! It has no legs..." LOL I love it! Episode 58: This story is about the Wonder Family, and it follows the family-especially the little girl-as they minister to a variety of others in a number of ways. This is a story of transformation, and watching how love can change a child. This does include discussion of pregnancy loss, so if this is a sensitive topic for you, just be aware that the family goes on a camping trip so the parents can work on their emotions following the loss of a pregnancy earlier. While gathered around the campfire, the parents say they have both had the thought that they need to go to India and work in an orphanage. Episode 59: This one is again action packed. this is based off a true story about a journey from childhood into the danger-filled life of a Special Forces Green Beret! I particularly like how this episode points out that our children are not always called to do the same as we are, and as a result they may feel torn between what they feel called to do, and what we expect or want. Episode 60: This is a continuation of Episode 59, and it shows the Eubank family helping others and teaching them about the love of Christ. My favorite part is the acting and the ambient sounds. It brings the stories to life, much more than an audio book could do. For examply, in Episode 59 you can hear the whinny of the horses, hear the hooves on the ground, and the birds chirping in the background. You can almost feel yourself there. Overall, we really enjoy the Brinkman Adventures. They are great for family or group listening, and we like to just play them during our homeschool day. WOOHOO!!!! SAVE 10%!!!! 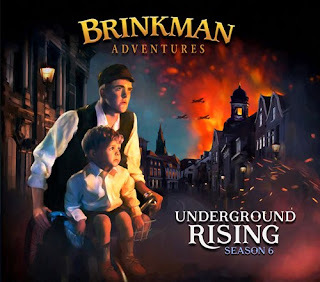 I am only one of 70 reviewers who reviewed Brinkman Adventures Season 6: Underground Rising. Please click the banner below to read more of those reviews!